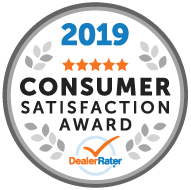 We are happy to announce that Davis Chevrolet Airdrie has been awarded DealerRater's 2018 Consumer Satisfaction Award for the fourth year running! We take great pride and pleasure in providing quality service to our customers! Read our valued customers testimonials or come into Davis Chevrolet and see for yourself! We also received the first ever CarGurus award for Top Rated Dealers by our own customer reviews through the CarGurus used vehicle site.